In many areas of the country, butternut squash is in season. I really like butternut squash. It has a silky texture and a natural sweetness that makes it perfect for soup. Winter squash is super easy to cook because of its thin skin that you can simply peel away using a potato peeler. The pulp of the squash cooks up relatively quickly. 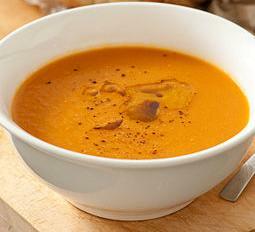 I thought I’d share my favorite Yummy and Healthy Butternut Squash Soup recipe with you. This is the perfect soup to warm you up on a cold evening, and it can easily be made ahead of time and warmed up so that it is a convenient way to have a homespun meal on the go. This recipe also allows me to use one of my favorite fruits, the apple. I have blogged before about how much I love apples and about how healthy apples are for you. With this recipe, you get a mix of both delicious flavors that just oozes “fall harvest”. Heat the Promise Buttery Spread, olive oil, onions, and chili powder in a stock pot on medium heat until the onions are tender (around ten minutes or so). Add your apples, butternut squash, and veggie broth. Bring the mixture to a boil, and cover. Reduce heat to low and cook until the squash and apples are very soft (around thirty minutes). Using a food processor or blender, puree the mixture, adding your pepper and salt (or Mrs. Dash). Add the apple juice to the mixture to thin it out; inversely, you can also add a cup of yogurt to make it even creamier. This is delicious when topped with a dollop of low-fat sour cream. Each one cup of soup is around 140 calories – more if you add yogurt! oh, the joy! I need you to make this for me... or at least fax me a bowl? C'mon girl! I'm HONGRY!